The 2017 BIM Contest award ceremony was held on the 27th of March 2017. Polantis and « l’Ordre des architectes » ( our contest’s partners) both welcomed the guests and the construction professionals at the Récollets Chapel. 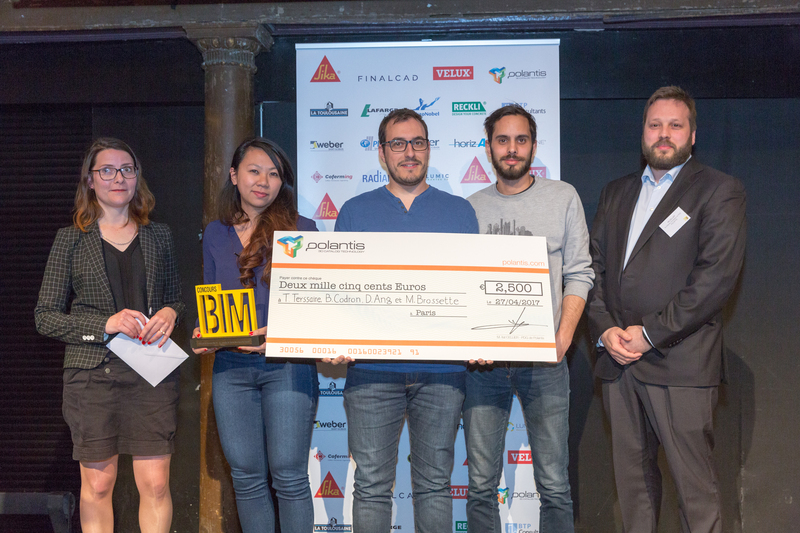 Last year, the first edition of the BIM Contest in partnership with the city Bobigny had been a real success. This year, Polantis – the organizing company – increased the difficulty by asking its candidates to work on the new city center of the municipality of Saint-Prix (95). Teams had to conceive a digital model of several residential and commercial buildings both integrated in a wider project articulated around the concept of the municipality’s urban centrality. Altogether, 198 candidates gathered in 49 teams worked on this project. Among the 9 finalist teams, 6 were French and 3 were international (Serbian, Egyptian, Italian). 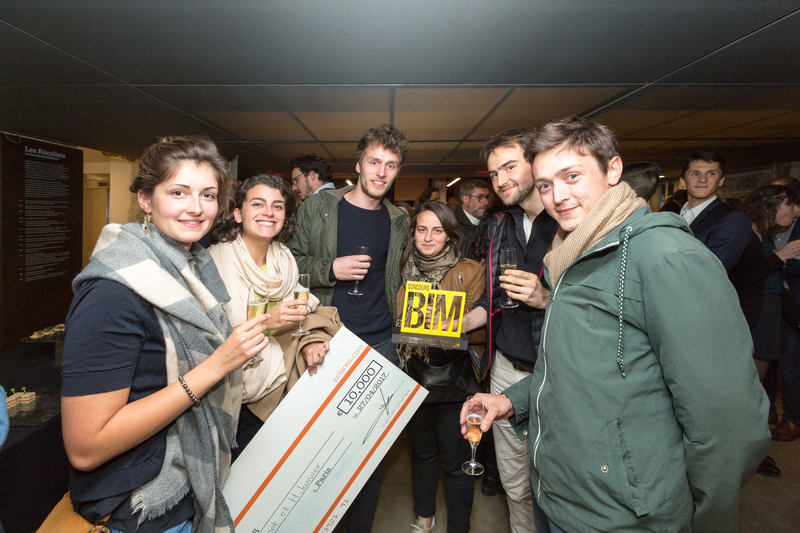 Quentin Guillemot, Gabrielle Larmet and Hugo Janvier, architecture students at « L’Ecole Nationale Supérieure d’Architecture de Nantes » received their first-prize. 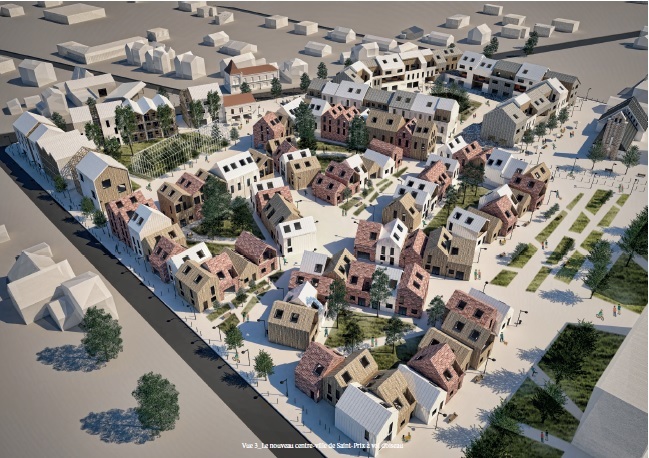 Jury’s comments: A strong engagement and a magnificent architecture of a « village in the village » which redefines and blurs the distinction between individual and collective dwellings. 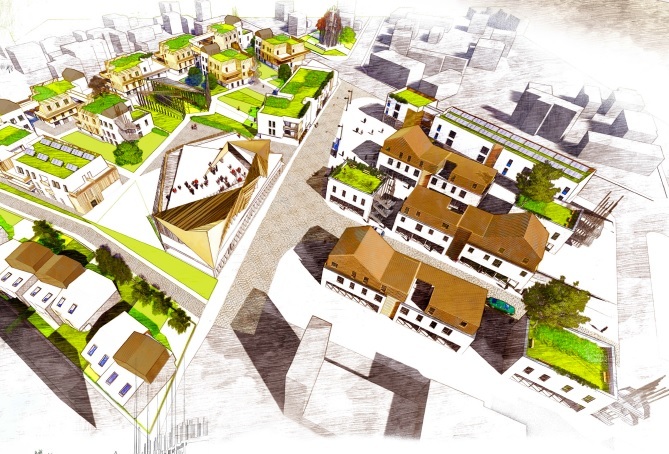 The garden-piazza suggestion is reinterpreting the concept of the garden-city by adapting it to our age and to the expressed needs and desires of the town dwellers. The urban reinterpretation is astute: the urban island is not split into two, the street traffic is well-thought, the traffic lane becomes a green way which places pedestrians at the heart of the project. When it comes to the BIM method, the information matrix provided is complete and the project model is optimized and mastered. The jury’s members enjoyed “moving around in the digital model” while deliberating. The second prize was won by Kévin Bailly, a young architect at Valode & Pistre who already won the BIM Contest first prize last year with Minh Minh Nguyen. Saint-Prix municipality particularly welcomed this project which better meet the architectural and urban expectations of the municipality. The team was particularly attentive to the municipality’s identity. 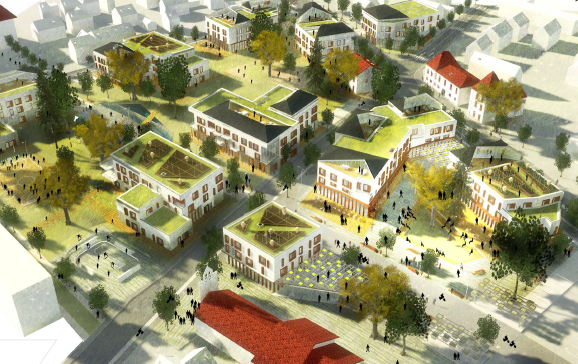 Jury’s comments: The landscaping work is in continuity with his project and the green roofs are used properly. The glass roofs and the variety of the slopes, forms and materials make you want to live in this city center characterized by its rich architecture. The use of columns is conveying an airy feeling. Finally, the particular attention to public areas make you want to meet in this city center which fosters living-together. Thomas Teyssaire, Bruno Codron, Dany Ang et Matthieu Brossette from l’Atelier Juno won this 3rd prize. Jury’s comments: A valiant effort of centrality in this project which has a lot of character. The pedestrian walkways were particularly well taken into consideration. The jury evoked the surprise effect of the promontory, the new perspective on each street corner, the pedestrian bridges leading to the project’s emblematic places. The attractive idea: the theatre’s roof which becomes a boardwalk for the citizens, in the same vein as what was done for the Philarmonie. The jury’s members were awarded for their deep analysis of the architectural projects submitted by the candidates. They were awarded for taking into account the BIM approach of each team thanks to their analysis of the provided digital models (on eveBIM of CSTB) as well as their precise analysis of the information matrix which were providing a high-level of information about the buildings. Jury’s members: Bertrand Delcambre, President of PTNB program (the Digital Transition for Buildings’ Program implemented by the French government), Céline Villecourt, Deputy Mayor of Saint-Prix in charge of urbanism, Hélène Alonso, Marketing manager at Sika, Nicolas Land, Architect and agency head of « Louis Paillard Architecte et Urbaniste », Éric Lebègue, Partnership Manager at CSTB and Itaï Cellier, Architect and CEO of Polantis. The cocktail following the ceremony was the occasion to admire the « BIM Contest » trophies which were printed in live by a 3D printer especially installed for this occasion. The three trophies received by the candidates were printed by Volumic Company, constructor of the 3D printing situated in Nice. It was a hundred percent French printing, made from PLA, an entirely biodegradable plastic made from corn starch. 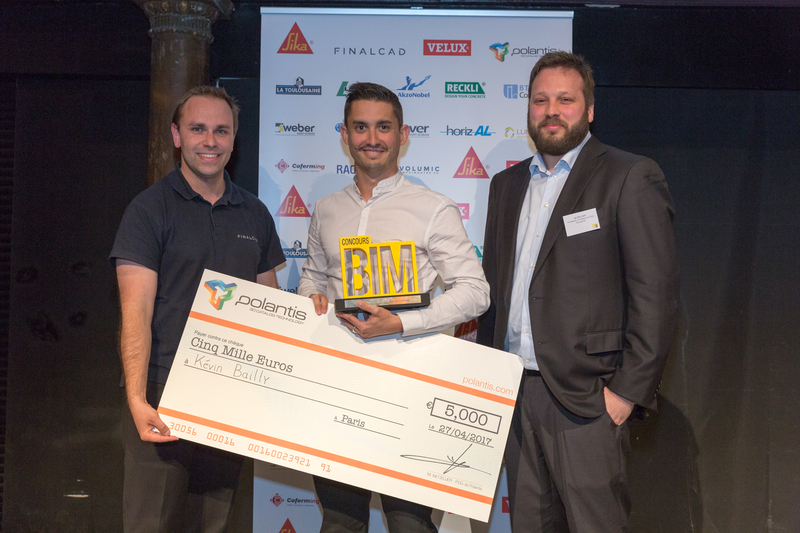 The 2017 BIM contest was sponsored by the following companies: Sika, Velux, Finalcad, AkzoNobel Powder Coatings, BTP Consultants, Coferming, Horizal, Isover, Placo, Weber, La Toulousaine, Lafarge, Lumicene, et Reckli. The contest was also supported by the municipality of Saint-Prix, the PTNB program (The Digital Transition for Buildings’ Program implemented by the French government), Le Club Prescrire, Construction21, CSTB, Mediaconstruct, l’Ordre des Architectes d’Île-de-France, le Conseil National de l’Ordre des Architectes, Sightline, Astus Construction, l’Unsfa, HexaBIM, Lumion, Volumic 3D et Radian. Click here to see the video of the 2017 BIM Contest. If more information needed about BIM Contest, please contact Manon Roger at the following number 01 42 64 07 02 or at manon@polantis.com.